Tonight's (Monday's) scheduled International League game between the host Pawtucket Red Sox and the Buffalo Bisons (AAA-Toronto) at McCoy Stadium has been postponed due to rain and wet field conditions. The game will be made-up as part of a single-admission doubleheader tomorrow (Tuesday) at 4:05 pm at McCoy. Both games will be 7-innings. Gates at McCoy will open at 3:30 pm. 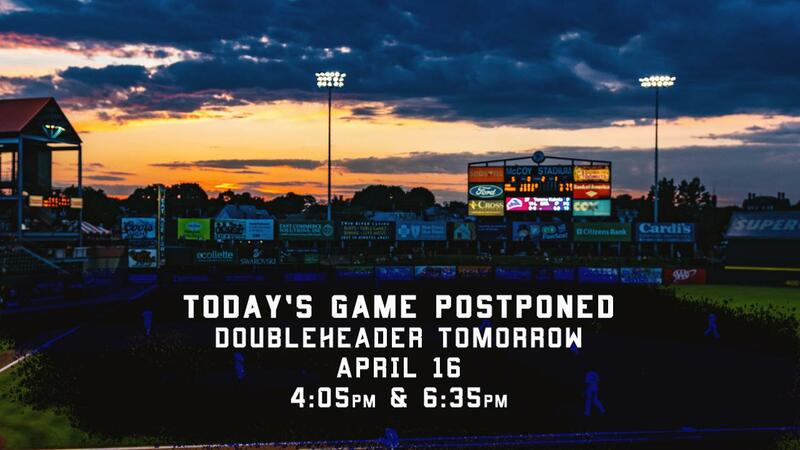 Tonight's postponement is the first at home this season for the PawSox and the third of the year already (April 5 in Syracuse and April 10 in Buffalo). The PawSox endured 5 postponements last season (4 at home and 1 on the road). Star Attractions - After holding Tim Tebow in check over the weekend while taking 3 of 4 from Syracuse at McCoy (Tebow was 2-for-9 with 1 RBI in his three games played during the series), PawSox fans will now get to see the #1 prospect in all of Minor League Baseball when Vladimir Guerrero Jr. plays for Buffalo. Vladdy, who just turned 20 last month, was injured in spring training with the Blue Jays and just joined Buffalo last Thursday (he is 5-for-10 with a double, a homer, 2 BB & 5 RBI in his first three games). He hit a combined .381 with 20 HR & 78 RBI in 95 games between Double-A New Hampshire and Triple-A Buffalo last season to earn the 2018 Minor League Player of the Year from Baseball American and USA Today. He is the son of 2018 Baseball Hall of Famer Vladimir Guerrero and the nephew of former big leaguer Wilton Guerrero. Vladdy Jr. is not the only son of a famous Major Leaguer on the Bisons roster, however. INF Cavan Biggio is the son of another Major Leauge Hall of Famer (Craig Biggio) while Bo Bichette is the son of former big league outfielder Dante Bichette. Cavan is off to a hot start (.394) while Bo is not (.220).